Samsung Galaxy S3 is latest Android smartphone mady by Samsung Electronics. It comes running Android 4.0 Ice Cream Sandwich operating system out of the box (Android 4.1.2 Jelly Bean update has roll out), powered by a quad-core 1.4GHz processor. The Galaxy S3 also has an 8-megapixel rear-facing camera, and a front-facing 1.9-megapixel camera. Its 4.8-inch display can display HD images. For storage, Samsung Galaxy S3 has up to 64GB of room for music, movies and photos. Samsung Galaxy S3 will roll out to AT&T, Sprint, T-Mobile, Verizon and U.S. Cellular. And now, Amazon has discounted the Galaxy S3 for Sprint, so whoever has been eyeing these handsets and doesn’t mind being on Sprint – now’s a great time to make the move. 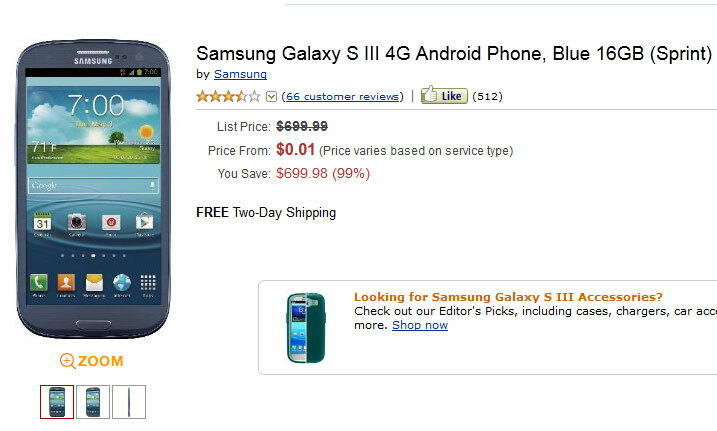 If you missed the recent discount, Samsung Galaxy S3 is an deal at just $0.01 on a two-year contract. This is by no means bad.